"Taking the traditional s'more and giving it a Halloween twist! Perfect if you don't have a fire pit for roasting and great for a crowd. The only 'cooking' involved is melting the chocolate. If you don't want to take the time to melt the chocolate, they sell chocolate icing in piping bags already for cakes and cookies. You can buy those for easy use, especially if this is for kids." Spread about 1 tablespoon marshmallow fluff evenly onto 1 side of each graham cracker square. Melt chocolate in top of a double boiler over simmering water, stirring frequently and scraping down the sides with a rubber spatula to avoid scorching. Cool chocolate for 1 to 2 minutes. Spoon chocolate into a piping bag or a plastic bag with a corner snipped. 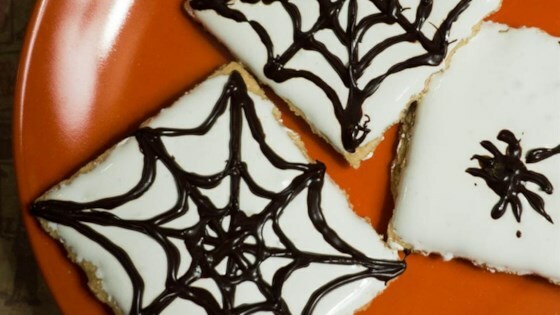 Pipe chocolate in the shape of a spider web onto the marshmallow fluff of each graham cracker. Put a dot with some legs in the corner to represent a spider. What's really great about this recipe is that it can be tailored for a huge crowd (using the whole box of graham crackers) or for a small gathering (using only as many as you need). If you want to toast the marshmallow, you can either take a match (adults do this for your child) and hold it over the marshmallow fluff to give it a burnt look or stick it in a toaster oven for 5 minutes or until it is toasted a little bit. If you're really lucky, around this time of year they have candy insects out in the stores that you can even place on the s'more instead.